From there the Nasdaq plunged almost 8% and closed at 2147 giving back the entire gain of December. 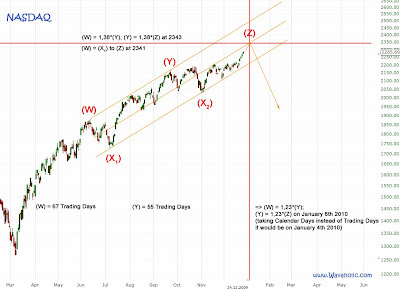 Early February should be quite bullish just like early January since I expect Minor wave 2 to unfold. 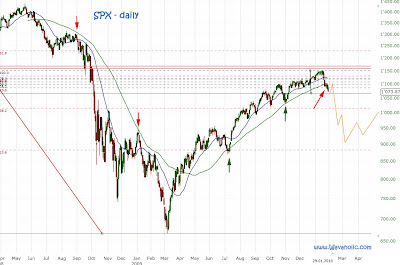 But then somewhen in mid February Minor wave 3 should start and lead to a big plunge probably down to 1000 in the SPX. The MA's in the chart are the MA 29 and 76. While the MA 29 often stopped short term rallies/sell offs the MA 76 concluded medium term rallies/sell offs after the MA 29 was broken. In Primary [B]/ both Intermediate (X) waves ended at the MA 76 (green arrows). It looks now as the market broke below this MA and I'd love to see a retest of it from below what may finish Minor wave 2 (like what we saw in June 08 after the break of the MA 76).